In two recent issues of this magazine, correspondents have raised the subject of the L. & N.W.R. suburban services, and so the following brief account of a gallant fight which this Company is making against its competitors in a provincial city may interest readers of the LOCOMOTIVE NEWS. We propose to deal with only one line of the many which radiate from the city, but it is the one which .carries probably the largest volume of purely suburban traffic, and on account of the severity of its gradients, the weight and number of its trains, and the variety of locomotive types employed, appeals most strongly to those interested in the working of railways. The line in question extends from Birmingham (New Street Station) northwards to Lichfield (City), just over 16¼ miles, but we are almost entirely concerned with the southern half, 8¾ miles long, between Birmingham and Four Oaks, at which station nearly all the trains terminate. A gradient profile , of the section between Aston and Four Oaks has been drawn, as nearly accurately as is possible from observations of the gradient boards and mile posts from the passing train, and as the writer was a regular traveller on the line from 1910 to- 1914, and again from 1917 to 1919', he can claim to know it well, but as he is no longer in the district, the information here given does not necessarily apply to the present day. From the east end of New Street Station, the line falls steeply through a tunnel for about a quarter of a mile, and then follow some very short switchback gradients, as steep as 1 in 53 and 1 in 57, extending-to Proof House Junction, where the Four Oaks trains diverge sharply to the left from the main Rugby line, and immediately climb at 1 in 60 on to a viaduct which carries them over the end of the Curzon Street goods sidings. From the viaduct the line falls again, first at 1 in 60, and then at much easier grades, through Vauxhall Station (nearly 1½ miles from New Street) to Aston 2½ miles). Here, whilst the line to Walsall continues straight, that to Four Oaks branches off to the right round a very sharp curve, and soon, carried on a high embankment between the General Electric Company's works and a reservoir, begins to climb at 1 in 95 for over a mile, passing Gravelly Hill Station. From the summit of this bank the upward tendency of the line is maintained at 1 in 330 to Erdington. 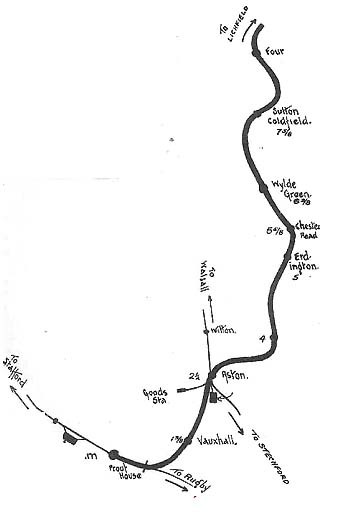 The gradients may readily be seen from the diagram, but it is necessary to add that between Aston and Gravelly Hill, on the 1 in 95, there is a sharp reverse curve nearly half a mile long, whilst from the tunnel mouth at Sutton Coldfield the line to Four Oaks bends right round in the form of a bow for nearly three-quarters of a mile, and only the last 400 yards into Four Oaks, where trains visibly accelerate, is straight. The line is double throughout, and there are four tracks from Vauxhall to a point just outside Aston Station. The four sets of metals converge into two just where the extra accommodation would be most valuable, for at present all engine movements into and out of Aston sheds, goods trains to and from Aston goods station at one side, and the connecting line running to Stechford on the main Rugby line at the other, as well as the entire Four Oaks service, and the Walsall and Wolverhampton trains via Witton, are conducted over one up and one down set of metals, and in the absence of flying junctions it is easy to see what a source of delay the Aston bottle-neck becomes. At Proof House also, up Four Oaks trains foul those going south to Rugby and London, and the approach to New Street Station is as constricted and congested as that to Aston. It is small wonder that the L. & N.W.R. suburban trains in the Birmingham district have a bad name for unpunctuality. As the up trains have such favourable gradients, little is to be said about them, but down trains calling at intermediate stations have three very difficult starts to make in succession, Gravelly Hill, Erdington, and Chester Road, and at the foot of the long climb are the facing points and curve at Aston. Here most drivers slacken speed to about 15 m.p.h., but some go through at 35 to 40 m.p.h. This is an experience worth having, in a six-wheeled coach. The last climb to Four Oaks would be much more trying than it is but for a quarter of a mile down at 1 in 101 through Sutton Coldfield Station and tunnel. The trains, of which in July, 1919, there were 28 down and 27 up (with slight variations on Saturdays, and no service at all on Sundays), are of three kinds, fast, semi-fast, and slow. The fast trains run between Birmingham and Lichfield, Burton, or Derby, and in the down direction are non-stop between Birmingham and Sutton; in the up direction, between Sutton and Vauxhall. North of Sutton they call at all stations. In pre-war days there were, I believe, five down and six up, but now (December, 1920) their number is redqced to four down and two up, and a number of Lichfield connections are made with the slow trains at Four Oaks by a four-coach auto-train (worked by 2-4-2T No. 975) running between those points. For the fast trains loads do not often exceed four bogies (about 106 tons tare), but one up and one down at least regularly take an extra bogie first weighing, I believe, 28 tons. In the down direction, just over 7½ miles from Birmingham to Sutton were booked to take 14 minutes, but only 12½ was the time taken on one occasion by 0-6-2T No. 55, with 106 tons. The working book allows five minutes for the 2½ miles from the Birmingham start to Aston, but this is a counsel of perfection, and the distance nearly always accounts for 5½ to 6 minutes. Consequently, the pre-war fast trains used to run the five miles (exactly) from Aston (slow pass) to Sutton (stop), including three miles continuously uphill at 1 in 95, 1 in 330, 1 in 107, 1in 266, in 8 or 8½ minutes. Since 1917, this 14-minute booking has been stretched to 16 minutes, but the trains are slightly heavier and certainly much more crowded. I recorded an occasion in July, 1914, when 2-4-2T No. 838 ran from Aston to Sutton in 7 mins 47 secs., with 106 tons. The 5ft. 6in. double-ender tanks used to do very good work on these trains, of which they had almost a monopoly, but now the 5ft. Oin. goods engines and 0-6-2 tanks are more often employed, and I think the 8.25 a.m. and 9.10 a.m. up trains from Lichfield are now regularly worked by a 4-6-2 tank and a Precursor tank respectively, the former being a heavy train of about eight bogies. About 1914, a 6ft. Oin. 2-4-0 'Sirius', then stationed at Walsall, worked daily for many months on the 2 p.m. from Birmingham to Derby and back, reaching New Street again at 6.26, but the few journeys I had behind this engine were very slow, and it seemed too 'long in the legs' to get going up the banks. The semi-fast trains are the hardest to work, being the heaviest. They run non-stop between Birmingham and Gravelly Hill (four miles) or Erdington (five miles), but call at all stations north thereof. In 1914, there were six down and five up, now there are three down and four up. For these trains there are four eight-coach bogie 'sets' made up, each set weighing 195 tons, and a set of eleven six-wheelers weighing 165 tons. The six-wheelers are elliptical-roofed stock of modern design introduced in 1911, each coach weighing 15 tons, and as the train is close coupled it occupies comparatively little platform space for the accommodation it provides. As far as I know, this stock is unique on the L. & N.W.R., and there are no other coaches like it on the whole system, neither has it, to my knowledge, been described or illustrated in any railway publication. These 'sets', however, are quite insufficient for the traffic, and are often strengthened with an additional four-coach set weighing 100 tons or more, or a train is often made up of three four-coach sets, weighing in all 318 tons empty! From 1918 onwards, the 6.15 p.m. (Saturdays excepted) and 1.7 p.m. (Saturdays only) from New Street, regularly loaded up to 270-320 tons empty, and as they were invariably packed with people the load behind the engine must sometimes have been 350 tons. These were the trains which the little Webb 0-6-2 tanks started from rest up a gradient of 1 in 95 day after day, night after night, in all weathers, simply as a matter of course! Long ago, there used to be five or six Precursor tanks stationed at Birmingham, and when a few of these left the district their places were taken by 4-6-2 tanks, but in the last three years the bulk of the traffic has been borne by the Webb 0-6-2 tanks, both 5ft. Oin. and 4ft. 3in., helped out by an occasional Precursor or Experiment ! The 6.15 p.m. from New Street is allowed six minutes to pass Aston and eleven minutes to clear Gravelly Hill, the first stop (four miles). Then follow four other stops, one of 2 mins. duration at Sutton, where the engines of down trains take water, and finally Four Oaks is reached in 34 minutes. It was only on fine, dry evenings that the little tanks could keep time', and about the middle of the post-war period of which I am writing, 1311 'Napoleon', a Precursor, or 1413 'Henry Cost', an Experiment, were sent down from Monument Lane shed to work this train. It was interesting to note that they did little, if any, better than the Webb tanks. In fact, one wet night, 'Napoleon', with 270 tons tare, slipping badly on the bank from Aston to Gravelly Hill, was finally 'stalled', and the train remained standing for forty minutes until a light engine came up from Aston and shoved us into Gravelly Hill Station from the back, and then again up to Erdington, where it left 'Napoleon' once more in sole charge. All then went without mishap until the last lap to Four Oaks, where the combined effect of wind, rain, gradient, curve, and load brought 'Napoleon' to a dead stand once more, but this time the driver managed to restart without assistance, and we finally crawled into Four Oaks 1 hour 40 minutes after leaving Birmingham, having disorganised the entire service for the rest of the evening. This catastrophe might have been averted by more skilful driving, for, as the guard on this occasion remarked to me, 'It makes a big difference who's in front'. Certainly, some very good performances used to be put up by Crewe drivers in the days when they worked the 1.7 p.m. (Saturdays only) with various types of express engines from Shed 15. On a service like this there was far more distinction between the work of different drivers with the same engine than between that of different engines with the same driver. The lighter semi-fasts, like the 5.5 p.m. from New Street, weighing about 215 tons when fully loaded, used to reach Four Oaks in 28 minutes if making five intermediate stops, 26 if making four. Both schedules demanded good work, but have now been increased by two or three minutes. On one of these trains, weighing approximately 210 tons, No. 2665, a superheated 4-6-2T, ran from Birmingham to Gravelly Hill (start to stop) in 7min. 10sec. at an average speed of 34 m.p.h., creditable work considering the shortness of the journey and the difficulties of the road. There remain only the slow trains to be described. These call at all seven intermediate stations, the old standard booking for the down trains being 30 minutes, which was increased about 1913 to 33 minutes. Nevertheless, I have frequently recorded instances of the journey being made in 31 minutes, both by the Webb six-coupled tanks and the * Bowen-Cooke superheaters, with the usual load of eight bogies. These trains are now the most numerous, there being about twenty in each direction, and they are worked indifferently by all classes of engines; fast summer, in fact, a 'Claughton' used to take the 5.37 p.m. from New Street, then running back to Birmingham light, as was the custom with large tender engines. Incidentally I may say that the usual procedure for the tank engines is to run chimney first out of Birmingham, and bunker first on the return. It is difficult to compare the performance of the engines, as this was to so great an extent dependent on the habits of the enginemen, one driver getting much better work out of a small engine than another would out of a big one. Generally speaking, I should say the Precursor tanks did the best actual running, but for their size that of the Webb 5ft. Oin. 0-6-2 tanks was the most meritorious. The Bowen-Cooke superheaters were so carefully 'nursed' that no reliable estimate of their ability could be made. This was strange, because the larger and heavier Precursor tanks were most unmercifully thrashed on occasion, likewise all the Webb engines. And as they were double-manned and were in service about 18 hours a day, they generally ran with leaky packings and filthy boiler water, whilst the Bowen-Cooke engines were, if I am not mistaken, in a comparatively 'cushy' billet at Monument Lane sheds, the passenger engine depot for the district, Aston being chiefly a goods engine depot, but housing the tanks for the Four Oaks service on account of its more accessible position. In conclusion, I append a list - an incomplete one, I fear - of engines which have, from time to time during the period covered by this article, been in regular service on this line. 0-6-2T 5ft. 0in. (Webb) - 14, 16, 46, 55, 80, 115, 118, 283, 317, 345, 356, 495, 593, 596, 599, 624, 741, 972, 1095, 1563, 1587, 1588, 1590, 1597, 1601, 1622, 1627, 2019, 2133, 2211. 4-4-2T 6ft 0in. (Whale) - 612, 616, 784, 803, 827, 834, 875, 920, 935, 1295, 1427, 1523, 1551, 1572, 1981, 1984, 1985, 2165, 2446. 4-6-2T 5ft. 8in. (Bowen-Cooke) - 217, 316, 632, 858, 1186, 1366, 1688, 1692, 1710, 1728, 1734, 2004, 2665, 2666, 2670.